Author Colson Whitehead addresses the University Concert and Lecture Series crowd at UNC Greensboro on Thursday, Feb 8. 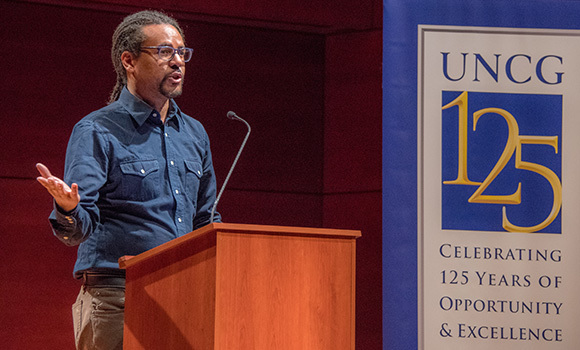 Author Colson Whitehead spoke last week at UNC Greensboro’s University Concert and Lecture Series (UCLS), opening with a personal comic monologue and reading several selections from his Pulitzer Prize-winning novel “The Underground Railroad,” for which he used documents from UNCG’s Digital Library on American Slavery (DLAS). As part of the special 125th anniversary lecture, he took questions from the audience reflecting on his creative decisions and the historical realities portrayed within the book. Whitehead also held an intimate discussion with students from a variety academic programs and levels of study. Whether they were students of library science adding to the DLAS, history students who had used the resource for research, African American and African Diaspora studies students analyzing Whitehead’s work for their dissertations or MFA in Creative Writing students at the beginning of their careers, they came prepared with serious, thoughtful questions concerning the novel and Whitehead’s interpretations of its contexts. “I think that each scholar who attended the discussion with Colson Whitehead left with a better understanding of the author, his works and our own scholarship,” said senior history major Victoria Starbuck, who is presently completing an honors thesis that examines the lives of women depicted within the DLAS’s runaway slave advertisement collection. Starbuck, along with other students, appreciated the opportunity to hear from a writer who had worked with the same six to eight-line advertisements that may be the only record of the women who are the focus of her research. On March 1, Morrissette will lead the Friends of the Library Book Discussion of Colson Whitehead’s “The Underground Railroad” in conjunction with the exhibition of work by Sanford Biggers, currently on view at the Weatherspoon Art Museum. The talk begins at 7 p.m., with a pre-talk reception at 6:30 p.m., at the Weatherspoon.